I spent a few days last week in sunny San Diego for work. I decided to fly out there a day early and get a rental car so I could explore some outlying areas of San Diego. 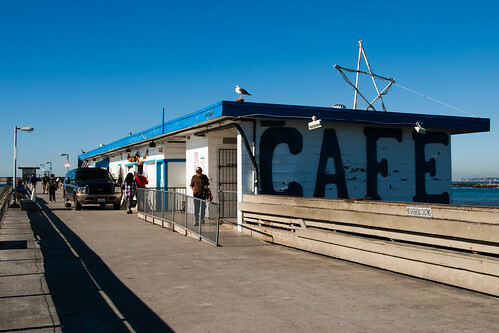 Friend Burgh Gourmand had talked of this taco shack out on the pier at Ocean Beach, which piqued my interest, so as soon as I got my car, I drove straight to Ocean Beach in search of tacos. 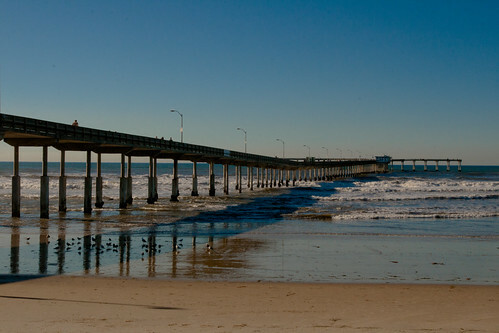 The pier wasn't hard to find, but I certainly didn't expect it to be so long! Kind of cruel to make people walk so far for tacos, no? Are we there yet?? 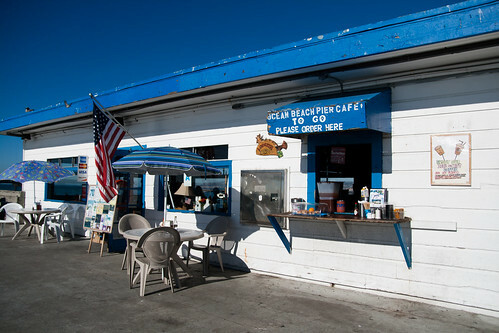 And towards the end of the long walk is the Ocean Beach Pier Cafe. Really more than a taco shack, but it's not a big place for sure. It has some indoor as well as outdoor seating. 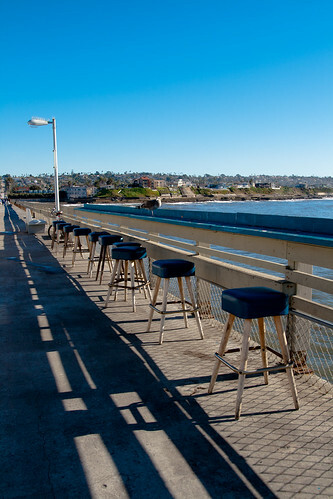 But tell me, why would anyone want to sit inside in beautiful, sunny, 70-degree San Diego? OK, maybe not the counter seats above. I thought to myself, what could be better than enjoying tacos with a beautiful view of the ocean? Well, as soon as I set down my tacos at one of the seats, seagulls came crashing my little taco party. So I moved to the safer patio seats by the entrance of the restaurant. I ordered the popular Lobster Taco, topped with cheese, cabbage, salsa, and a white sauce. 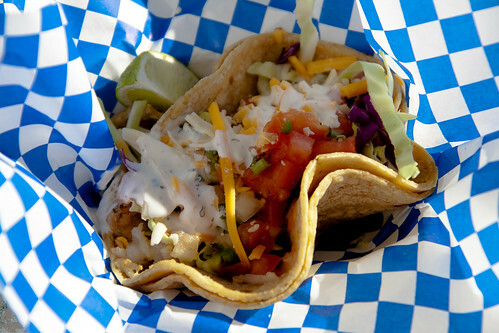 The taco is a double dose of soft corn tortilla. 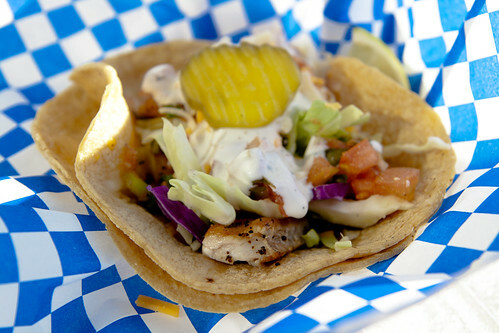 I also got the Famous Fish Taco, which is pretty similar to the lobster taco but with grilled mahi mahi instead of lobster. Both were delicious! The seafood was tasty and the tortillas were fresh. I had wondered why they had doubled up on the tortillas, and then I realized that two tortillas were needed to hold the hefty amount of fillings and the sauce! Still, the sauce was dripping off my arm so I had to give up and use a fork instead (which was supplied - smart). All in all, it was a lovely first meal in San Diego. Thanks for the recommendation, BG!